When planning your vacation to Thailand, be sure to check your passport’s expiration date, as it must be valid for the duration of the entire trip. Additionally, your passport may also need to be valid for no less than six months after the expiry date of your Thai visa. This only applies for citizens of some countries, such as China and Russia. 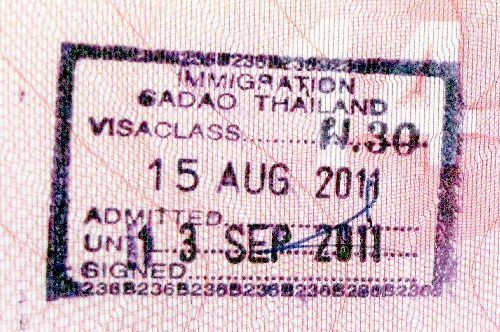 As of August 2011, a visa to Thailand is not required for citizens of most countries if their stay does not exceed 30 days. When you pass through immigration at the airport, your passport will be stamped. This 30-day entry stamp will have the exact departure date so you know when you have to leave the country. A specific requirement for obtaining a tourist visa to Thailand is evidence of adequate finances. In other words, you need to prove that you have sufficient cash to pay for your expenses while visiting the country. Currently, tourist visa requirements are 10,000 baht per person or 20,000 baht per family. You can obtain a tourist visa at a Thai embassy or consulate in your home country. This visa entitles you to a stay of 60 days. A 30 day extension will cost an additional 1,900 baht and can be purchased at immigration offices within Thailand. Please contact your nearest Thai consulate or embassy to get a full list of the documents necessary to apply for a visa. Getting to these countries is possible by plane, as a part of an organized tour (the so-called visa run), and also by renting a car and traveling on your own. This latter option allows you to take a joy ride through some of Thailand’s most beautiful countryside. You will also get to visit another country, while enjoying the trip at your own pace. And if you need to take a break from driving along the local European-quality roads, simply check into one of the many inexpensive roadside hotels along the way. If you overstay your visa in Thailand, the fine is 500 baht per day. Important: Rules and regulations are constantly changing. Please keep up-to-date with current information before you purchase your plane tickets or book a villa with us.